It's been a week since Timberman, and I think I'm still on an endorphin high from the race. It was hands down my favourite race of my triathlon career (Cornwall last year is a close second). The day turned out spectacularly thanks to a few key factors: 1) perfect plan execution, 2) fun maximization, and 3) excellent organization. 1) Despite significantly under-training by most standards, I spent the final few weeks of preparation for Timberman honing in on a plan for race day. 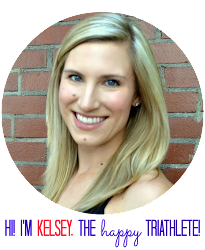 I practiced my nutrition and hydration by creating close to race simulation conditions (time of day, heat, pre-workout meal timing, intensity, etc.). And I made sure I knew what my race pace effort felt like, as I planned to use perceived exertion on race day. Then, I wrote a plan for the day in terms of pacing, nutrition, hydration, and the mental side of things. And I wrote a plan for dealing with adversity. Then, come race day, I stuck to the plan. 2) A very big part of the race day plan was to have as much fun as possible. The race was a huge success on that account. I smiled a LOT, if not the entire way. I thanked volunteers. I interacted with the amazing spectators. And I just constantly reminded myself how beautiful the day was and how lucky I was to be out enjoying it doing the thing that I love the most. 3) Timberman is a great race, and one that I would highly recommend. The town and surrounding area is very supportive, and the spectators and volunteers were top notch. The run became very hot, but the aid stations were well stocked with water, ice, cold sponges, etc. for us. I also had an amazing race sherpa in my mom! She was super helpful all weekend and definitely helped to take a lot of the race day stress off my shoulders. Now that the summary is out of the way, please bear with me, as this will be quite a loooong report because I have a lot to say about this one! We began the drive to Timberman on Thursday night after work, then finished up on Friday morning, arriving in Gilford around noon (it's about 6 hours from Ottawa). 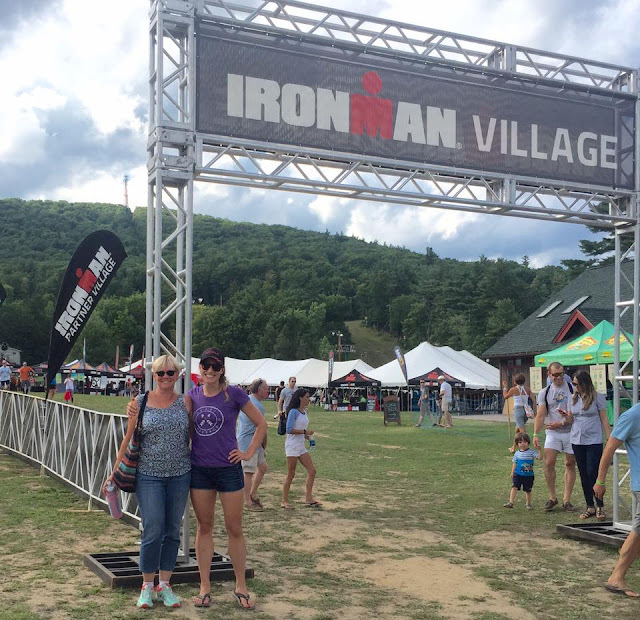 The first stop was packet pick-up at Gunstock Mountain Resort. It was smooth sailing through a short line and before I knew it, I was in possession of my first racekit for a Half Ironman! We made the customary tour of the merchandise tent, picking out a "names" tank top for me and an "Ironmom" t-shirt for my mom. After registration was complete, we drove about 15 minutes to our cute little cabin in Alton Bay. If you're doing Timberman next year, I highly recommend the Winn-a-bay Cottages. The owners were super nice, the cottage was minimal but very clean, and the price was great. Alton Bay is really cute too, and has lots of options for post-race ice cream! We checkedin, then had a quick lunch, before heading out to do our grocery shopping for the weekend. Friday flew by!! 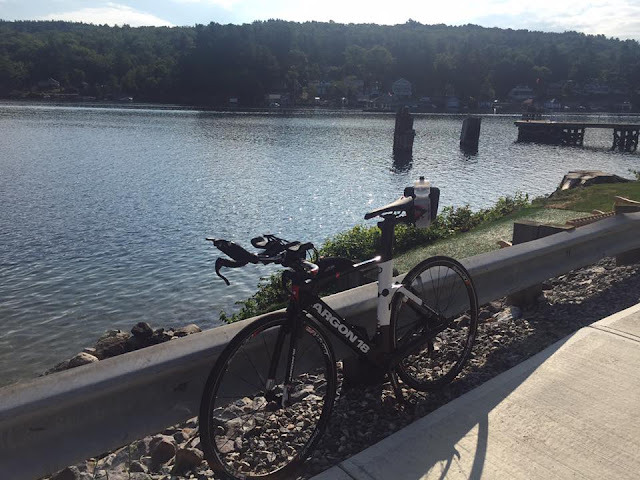 On Saturday, I did my pre-race activation bike and run in Alton Bay. During the run, I had a terrible side-stitch for the first time in years! It freaked me out a little bit, but stayed away for race day. I had breakfast, then took my bike for a check-up (the only hiccup was that the bike mechanics had moved to the state park, but we didn't know that so drove up to Gunstock Mountain). The bike was fine, of course, but I wanted to be 100% sure. 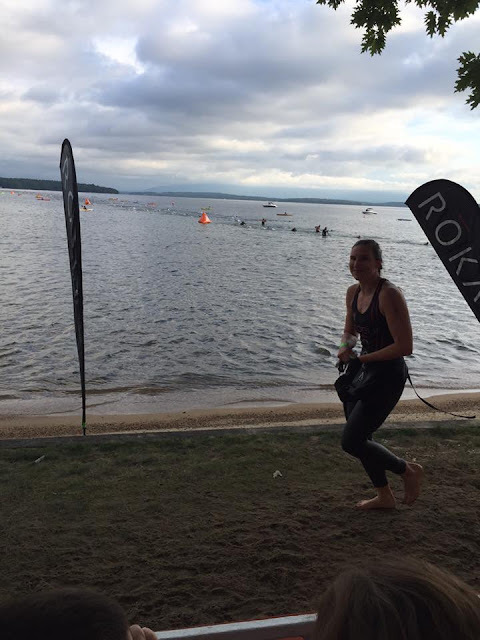 While we waited on the bike, I did a warm-up swim in the beautiful Lake Winnipesaukee. There was a lot of discussion among the athletes swimming there, because the swim start had been moved to an area of the beach that had a very shallow, rocky bottomed stretch of about 50m before we could reach water we could actually swim in. We all wondered whether and how we would run across those rocks if the start was a beach start. We also wondered how warm the water was and whether we would have a wetsuit legal swim! Luckily, I got the answers at the athlete briefing - water was currently wetsuit legal and the start would be an in-water start. Big sighs of relief!! After the athlete briefing, we returned to our cabin to make an early dinner and prepare for Sunday's race. I laid out my gear carefully, then packed it all up as we grilled our delicious dinner (no stove at the cabin, but we made do by throwing it all on the bbq) of salmon, chicken, veggies, and sweet potatoes. I painted my nails "mermaid" shades after dinner with a teal and a blue/green sparkle polish. We were in bed around 9:30. Up and at 'em for race day at 3:45! My swim wave was scheduled for 7:04 am, so I wanted to make sure that I had my 3 hours before race time to eat my breakfast. We loaded up the car and drove up to Gunstock Mountain to catch the shuttle. It was a smooth process and within no time, we were on site for the race. I got set up in transition and made a few stops at the port-a-potties before making my way to the swim start. Mom came over with me to keep me company and to take my morning clothes and bag from me. It was so nice to have her there, although I was a bit nervous and probably not the most fun to be around as I waited for the day to start. Before I knew it, wave #10 was lining up to head under the swim start arch. We watched the men leave in front of us, then were given the go ahead to wade out to the start line. The women in my wave were all chattering in a nervous, but friendly manner as we waited for the horn signifying it was time to swim. With the blast of the horn, we were off into the crystal clear and calm lake. My plan was to get out ahead during the first 200m or so, so I took off at a sprint. I couldn't help but think to myself how lovely it was to be swimming almost alone in this beautiful lake on a gorgeous morning. I kept the buoys in my sights though and focused on catching lots of water. Around buoy three, I saw another white cap pull up to me, then pass me. I tried to keep her in my sights, but by that point was having to dodge a lot of men in the wave ahead of me, so eventually lost her. The water had become a bit choppier as we got further out into the lake, so I tried to keep my focus and swim my own race. The swim simultaneously seemed to take forever, and to fly by, if that's possible. I was feeling strong and confident as I approached the swim exit, swimming until the last second as usual. Running out of the water, I realized there were two other women from my wave with me. 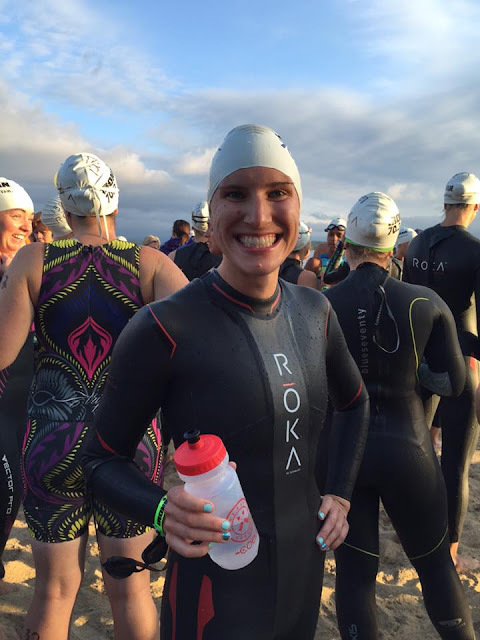 But, my plan for the day involved not worrying about anyone, but myself, so I took my time in T1 - getting my wetsuit stripped, putting my socks on, drinking some water, etc. to make sure that I was comfortable and READY for the bike. Pure joy. That is how I can sum up my bike ride at Timberman. It was the most enjoyable part of the race. I stuck to the plan of focusing on my own race, staying hydrated and eating every 10-12 minutes, and having as much fun as possible. The course was hilly and windy (in both directions?). At times it was crowded, and at other times, I felt like I was out on a nice long bike ride by myself. I got to say hi to Brian, Alan, and Amy though and those moments helped to fuel the journey. On one downhill, I whooped with joy, probably terrifying some of the people cheering on the side of the road, but I was so happy to be riding my bike that I didn't care (the way up that hill though had been my only moment of wondering what I had gotten myself into... so the way down was very sweet). My bike handling skills have always been a bit weak, but I am proud to say that I managed two very successful bottle grabs at aid stations to refill my front water bottle (regretfully, I missed the fourth and final aid station, so spent the last 15k with only a few sips of water). Most of the race was spent uber-focused on how my body felt, what my legs were doing, how far I was from the next rider, etc., but I also had some thoughts of how much fun I was having as well as the lyrics of Sia's "Unstoppable" running through my head (my new favourite pump-up jam after CBC's tribute montage to the Team Canada women from the Rio Olympics). At 30k, I was surprised to see that I was well ahead of my dream pace, which set off a little spark of hope that I could hold onto that pace for the remaining 60k. My legs were on board with that spark of hope it seems, and I finished way ahead of my highest expectations. All in all, Pistol Annie and I had an awesome time out on the bike course; I still LOVE riding this bike and together, we are damn fast! The run was tough, but still pretty fun! The course has two hilly loops along the lake shore through a residential area. There were tons of spectators all the way along the course and what seemed like endless aid stations (thank goodness!). The sun had come out at about 60k on the bike, and it was getting quite warm at that point, so on my way out of T2, I had some young volunteers slather my shoulders and arms with sunscreen. I also got to say hi to my mom right at the start of the run and again at the halfway mark - yay! My goal for the run was to hold on to a reasonable pace and keep my heartrate low. Given my run training this year, that pace isn't quite what I would like it to be, but I just wanted to finish the half marathon in one piece and to run the whole thing, so I knew that I had to be realistic. I carried a bottle with my leftover Osmo and I took a cup of water or ice at almost every aid station (some water in my mouth and some over my head). I also took two sponges to put in my tri top to help me stay cool. After ending up with heat stroke at Nationals, staying cool and hydrated was my top priority! At 7k, I had to stop, remove my shoe and massage my foot, since the ball had gone numb and tingly. It seemed to help clear it up, and my foot felt relatively normal the rest of the race. However, my left glute really didn't seem like it was doing its job, so that will be something to work on for next time. I got to see more friends out on the race course, including Magali who was crushing it. The run passed rather quickly and with about 2k to go, I thought, "I'm doing this. I'm almost done my first half ironman!!" It was a great feeling and helped to power me toward the finish line with quite possibly my biggest smile ever. Crossing a finish line is always a great feeling, but this time was especially exciting. I loved this race, and I surprised myself to discover that I truly enjoyed every second of it! If you had asked me how I felt about the distance in advance of the race, you would have heard a lot of trepidation in my voice, a lot of uncertainty, and a lot of doubt that I would even want to do another half iron-distance race ever again after I finished Timberman. Well, I was wrong. I love the 70.3 distance. It was a blast. Now, my day went extremely well and I know that it probably couldn't have gone any better, but it could have gone a lot worse. There are so many factors and elements that have to fall into place to have a good day out there and they all seemed to fall perfectly for me. 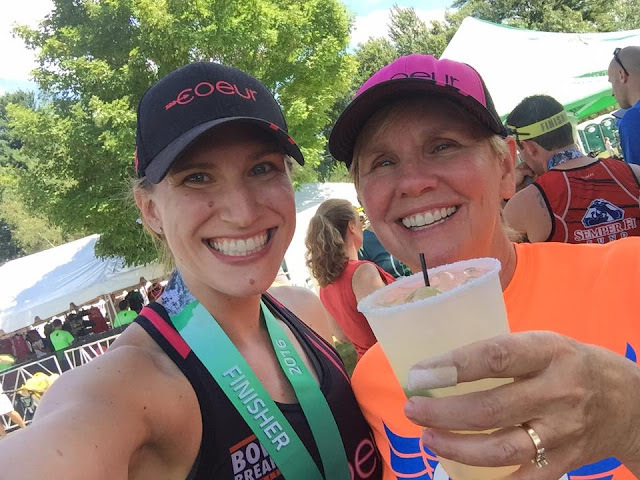 The weather was gorgeous, the spectators and volunteers were fantastic, my hydration and nutrition was spot on (at least for me), and I beat my expectations in terms of times. I know that it might not always work out so well, but that's the beauty of it and the challenge we take on when we race. I'm very excited to see where I can go with the 70.3 distance (particularly if I train properly for more than a month), and I'm so grateful for my experience at Timberman. Thank you to my super sherpa Mom! Thank you to Coeur Sports for your support and amazingly beautiful team race kit, for bringing cool/inspiring women into my life (hi Amy, Julia, Olivia, Denise, and Katie), and for hooking us up with some other awesome sponsors (Roka Sports and Argon 18)! 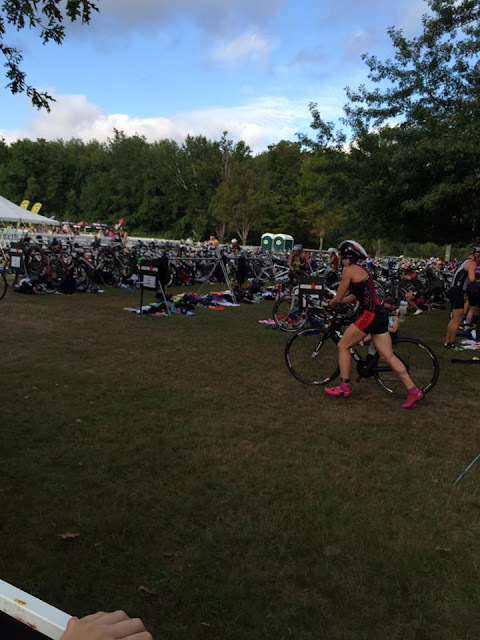 Training Update: One week to Timberman! With Timberman now just over a week away, it's definitely time for an update on my training. Since Nationals, I've really put my nose to the grindstone and have felt pretty good about my focus and my progress (even in the middle of moving houses!). Over the last two weeks, I've gotten in a few key sessions that have built some confidence going into the race. That said, I'm still just focused on finishing the race with much lowered expectations after a pretty mediocre summer of training. I do have quite a bit of extra motivation though lately thanks to the athletes crushing it in Rio at the Olympics!! Swimming: I've finally brought some consistency to my swim training, getting in two to three swims per week over the past few weeks. It's starting to slowly come back and I'm hoping for at least a decent swim at Timberman. The open water swim last Friday morning was definitely a highlight! I also had a great practice two weeks ago where I crushed 20x100s (1 each on descending intervals 1:40, 1:35, 1:30, 1:25, five times through). Biking: The bike has felt really good too. I have had two good long rides since Nationals. One solo and one with Jenn (on a hilly and windy route). Both left me feeling strong and more confident that I can handle 90k in a race. On both rides I practiced my nutrition and hydration strategy as well, and I think I found something that will work for me (sorry for not letting us stop for coffee in Wakefield, Jenn!). Running: And I brought my distance up to one last long run at 18k earlier this week. My running needs a lot of work in the off season, because I feel like I've totally lost my running form and fitness this summer, but I should be able to get through Timberman. It won't be fast or pretty, but I think I can get it done! So there you have it, it's mostly taper time with one more big ride on the weekend, and lots of rest / foam rolling / focusing on nutrition. Oh yea, thanks to the Ottawa Triathlon Club, I got to go to see the Ottawa RedBlacks play last weekend! Gorgeous night for a win! What events do you have left this season? How is your training going?